Many of you will know John Dondzila for his various homebrew games for the Vectrex. He was actually the very first to produce a homebrew game for the Vectrex. Although he hasn't released any new games for the Vectrex in a long while (and there is no sign that this situation will change in the future) he continues to sell his previous games via his website ClassicGameCreations.com. Some new information about John and his activities is now available; The third in the Vectrex interview series conducted by www.rfgeneration.com (the first was with Kristof Tuts and the second with George Pelonis), features an interview with John and it can be read here. 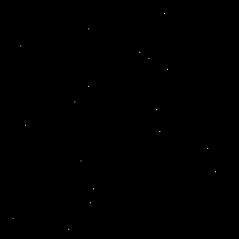 Royal 21 which was previously available in cartridge form for the Vectrex is now available as a freeware downloadable binary file. You can either burn this to EEPROM or put on a cart such as VecMulti or VecFlash (the latter no longer in producion) so you can play the game on your Vectrex. Alternatively, just load the file into your favourite Vectrex emulator such as ParaJVE. The file can be downloaded from here. Back in March 2010 I made a review for Royal 21 in the Video Game Trader Magazine issue #15. This magazine is free when it is viewed online. For those only interested in the Vectrex review select pages 12-13. Royal 21 is not a conventional card game. There is a Black jack element of the game that ensures that there is a mix of chance and skill. There is also what I would call a Tetris element that introduces arcade action and a sense of urgency to the game play. Visually, the game looks quite simple but the game play is actually quite addicitive. I rated the game at 3.5/5 in that review and after just playing the game again I think that score is still fair. Only two more days and the new iPhone/iPad app promising to reincarnate the Vectrex as best as can be done in a pixel environment will be launched. To wet our appetite RantMedia Games have just released a teaser of their new app. Who knows how well the vectors can be shown in a pixel display but with the acclaimed retina display of the iPad (3) the vector portrayal could be convincing. At the very least it should generate more interest in the Vectrex! Tuesday 13th November - Fury produces button controller for the Vectrex - Get it while you can! Fury is busy with the hardware releases again! He's produced a new controller called the Starblast controller. It doesn't include a joystick but is compatible with a number of existing Vectrex games. He claims that it offers a real arcade experience having a fire button that is an actual arcade button. The controller is compatible with Star Castle, Rip Off, Armour Attack, Space Frenzy, Repulse, Birds of prey, Vector Vaders and YASI. The new controller is of limited availabilty and is currently only being sold on ebay as a one day listing. On the first "International play your Vectrex day" which was held on 1st November a few Vectrex fans participated by playing a whole lot of Vectrex games on the day and posting pics of the games they had played, some sent pics of themselves posing with their beloved consoles. You can see all these if you head over to the Vectrex wiki page. I found the time to play just one game "Birds of prey" and simply submit my score and web link. Now you could say that those that played more than just one game went beyond the call of duty. But I was amazed when good Vectrex friend KosmikVector emailed me with photographs showing what he had done to support the day and to show his respect for the Vectrex. On the first of November 2012 he had a tattoo of the Vectrex put on his leg. The images on the right show the tattoo being made and the final result. Now that is Vectrex love! First off, happy "International play your Vectrex" day to everyone. The 1st of November marks this new celebration. Hopefully, this event will be a yearly occurrence, and more and more persons will get to hear about it and more will join the Vectrex faith. My aim is always to update the web site at least once a month but I have been and continue to be very busy with my day job leaving little pleasure time for Vectrex related stuff. My apologies to those who have sent me scores for the high scores page, I will update that page very soon. And I am hoping that closer to Christmas vacation I will have time to do an information overhaul on the site and update my VecCab blog. For the latter I have made progress, I just haven't had time to document it. A couple of weeks ago I wanted to do a news update and let people know of two very interesting interviews with Vectrex home brewers Kristof Tuts and George Pelonis aka Fury. Collectively, they had added to the expanding home brew library for the Vectrex and I thank them both for helping to keep the Vectrex alive. Both interviews are presented on www.rfgeneration.com and direct links are presented here for Kristof and Fury. Finally, of interest is that Rant Media, producers of the new Vectrex Regeneration app for the iPad/iPhone/iPod touch, have declared in a recent twitter message that the official release for the app will be at the end of this month. Let's see if they can keep their promise! Looking forward to seeing it in action. (1). On November 1, PLAY YOUR VECTREX. (2). Make a note of what game(s) you played. Your name will also be needed as part of the record for the International Play Your Vectrex Day wiki page. These two things are mandatory. There are also bonuses that can be added as well, such as keeping a record of your game scores, taking photos of your score(s), your Vectrex/collection, making a drawing or gif or something that is Vectrex-related, etc. Full rules and regulations can be seen on the Vectrex wiki page or on the Vector gaming forums. Saturday 8th September - The vectrexwraps project is back! Many years after the release of the first edition of the "wrap" (a colourful vinly overlay with combined YASI and Protector graphics for sticking onto the shell of the Vectrex and its controller pad), Michele Fiori has restarted his project and is taking preorders for some new designs. His new designs include a wraps for Scramble, and seperate wraps for Y.A.S.I and Protector. The costs of a wrap will be 30,00 USD for each unit +shipping (that depends from the delivery address and weight). He's taking preorders till the end of September. For more information please visit Michele's site at www.vectrexwraps.com. I was biding my time before mentioning on this website about the forthcoming new Vectrex emulator app for iPad and iPhone. I wanted to be sure it was actually going to happen rather than promote some form of vapourware. This forthcoming iOS app called Vectrex Regeneration is expected to be released before the end of the year. Looks like Rantmedia Games the app developer of the emulator is cranking up the press releases and I'm now convinced this app is going to happen! Yesterday the Penny Arcade website reported on Vectrex Regeneration and some of the challenges the Rantmedia Games developer team had to overcome. I.e. Getting the controls, sound and the line rendering right to make a convincing emulation of the Vectrex. Emulating the Vectrex vectors is no mean feat, so I'm really looking forward to see how this will look, what with the iPad (3) and its vey high resolution. More info about the "Vectrex Regeneration" app can be found here. Revival Studios presents Retrocade Magazine's Vector War II. Ten game Vectrex tournament kicks off 23rd August and ends 9th September. This will be a 10 game tournament to be played on original Vectrex hardware (including controllers). Multicarts are acceptable. Individual players must be registered with the Retrocade Magazine forums which is where this competition will be hosted. Score submissions should be posted to the tournament's score submissions thread. There are prizes! The winner receives a copy of Revival Studios' Shifted along with a Vector War II t-shirt. For the rules please go to retrocademagazine.net. One of my dreams is to have a full size arcade machine based on a Vectrex. This would mean using a much larger screen connected to the Vectrex rather than use its small built in display. A Vector monitor would be ideal but they are far and few between. Using a converted TV would be possible but What has prevented me from using one is my lack of knowledge on how to convert it into a vector display. 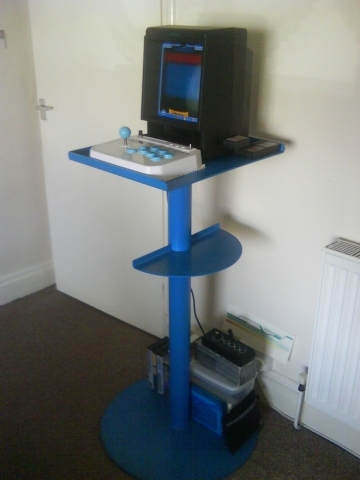 In my Vec Cab blog which describes an arcade cabinet I am building I've cheated by reducing the size (mainly the width) of a real size video arcade cabinet so that the 9inch screen of the Vectrex looks more in proportion. But recently I received some exciting news from a Richard Gellman aka Dr Phu, a member of the Retro Computer Museum. He sent me some information on the work he has been carrying out on converting a 21inch TV for use with a Vectrex. First impressions - wow! Click here to see a YouTube video of it in action. Ok there are still some tweaks required to get a perfect picture but he is almost there. A picture which comes from StiGGy's Blog shows the monster at a previous Retro Computer Museum gaming event. Note that one side of the cabinet is made from clear perspex so you can see inside the monster's inards. Richard, told me he was hoping to show the completed monster Vectrex in time to show at the next gaming event to be held at the end of August. A video of Jay Smith's keynote address at Classic Gaming Expo 2007 has been rencently uploaded to YouTube. This video was taken at Riviera Hotel and Casino in Las Vegas, Nevada where the CGE2K7 event took place. Here Jay talked about the history of the Vectrex and Microvision. At the end of his address there was a questions and answers seesion. Very interesting for Vectrex fans, although you might have to turn the volume up to hear all that was said. George Pelonis aka Fury is at it again! Known for his many and frequent homebrew software releases it seems he is applying the same philosophy to new homebrew hardware. Hot on the heels of last month’s announcement regarding his "Vectrosis" controller, today he has announced an additional new controller. Called the "Overdrive", this is a controller specially designed for Vectrex driving games. It comes with a mini metal steering wheel instead of a joystick plus four buttons. This controller is compatible with the following games: HYPERCHASE - POLE POSITION - VECTRACE - VABOOM! - SPIKE'S WATER BALLOONS. Fury has also stated on his website that he will be releasing two brand new games (PURGATORY - NIGHT TRUCKER) written with the "Overdrive" in mind. It should be noted that the "Overdrive" works completely differently from the previous "Vectrosis" controller and associated games are not compatible with the other controller. The output from the "Overdrive" is analogue, whereas the output from the "Vectrosis" is a stream of digital pulses. Price is $60.00 + FREE worldwide shipping. Astute readers of this website will have noticed a new tab called VecCab at the top of this website. This is a new blog I am writing detailing my adventures in building a full size upright cabinet housing the Vectrex. The goal is to make a system that would not look out of place in an 80's arcade. This will be both a hardware and software project. Software changes will be needed because I want to make the system coin operated (i.e. inserting coins to give extra lives). Anything I find to do with the Vectrex I mention it on this website. Well, the Retrocade Magazine (Vo1 Issue 3) Summer edition has just been released. This is a 128 page PDF selling for the price of a mere $2.99 stuffed with retro gaming goodness. This issue has a big feature on Tron being that its been 30 years since the film's release. But there is a lot more inside incuding the second part of the transcription I made of the guys from RetroGamingRoundup.com and their interview with Jay Smith. In this part of the interview Jay talks about the making of the Vectrex, the colour prototype and the various add ons and games. To see the full list of the magazine contents and to buy the PDF visit the Stonegamer.com website. Fury is definitely the most prolific homebrewer for the Vectrex. Not only is he proactive with multiple different games releases but he has just ventured into Vectrex hardware. He's releasing a new game in August called Hellhole. Ok that game was announced years ago on Fury's web site but now its available for pre-order and follows as part of the next story in his Sector X series of games. I could be wrong but from the screen grabs on his web site the game looks like some sort of Tempest type game. Another clue of the Tempest influence is that although the game can be played with a standard Vectrex controller, Fury is also selling it with a new spinner controller. Called the VECTROSIS spinner, its a newly manufactured spinner controller for your Vectrex console! Homebrew Spinner controllers have been available for the Vectrex in the past but they were in fact just modified Atari Driving Controllers. Indeed, a few homebrew and hacked games already exist that run with the Atari spinner (E.g. Pole Position and Star Castle). The new VECTROSIS spinner won't run with these games because it plugs into the first control port rather than the second as was the case for the Atari spinner, but Fury promises that he will contiune to write new games for his spinner. I do hope he will also make the spinner interface software code available to other home brewers so more games can be written for it and indeed facilitate conversion of the original ones. The Vectrosis Controller is being jointly released with Hellhole, debuting at CGE and begins shipping on August 13th. You can preorder by sending a paypal payment to his email address detailed on his web site. KosmikVector has recently sent me some pictures of his Vectrex setup. The blue stand is from one of those old Touch Master arcade operated touch screen video games. 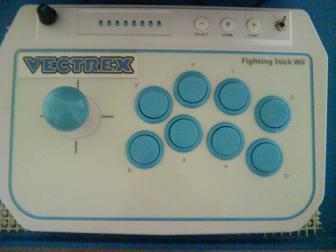 The controller is a Hori Fighting stick modified for use with the Vectrex. KosmikVector tells me that what’s different is that the Auto fire circuit included in the controller uses a 555 timer chip to give a controllable variable rate (super fire). The knob/potentiometer visible on the left of the controller is the tuning pot to match the auto fire rate to different games to enable maximum fire power. Always nice to see different Vectrex fan's setups. Remember the release last year of the Sundance Vectrex game by Fury? The game plot was "Control a matrix of black holes and rid the Universe of excess suns!" Although a relatively simple game it is very playable and pretty much 100% faithful to the original Cinematronics vector video arcade game which was released in 1979. Being the first vector arcade games made by Cinematronics and only having a limited production run, the Sundance arcade game is actually quite rare. Tim Skelly the creator of Sundance has been quoted as saying the game is "very fragile game, and few lived long". As such the game is highly sought after by collectors and there are many who aren’t even familiar (prior to Fury’s Vectrex release) with the game. So fair play to Fury, who has in effect helped to immortalise the game by giving it a wider audience via the Vectrex platform. Now although the packaging of the Vectrex game is nicely presented there was one thing missing. That is to say there's no overlay with associated artwork. Like many early vector games and the Vectrex too, colour filters or overlays were used to give the black and white Vector graphics different coloured tints. The original Sundance cabinet used an orange front plexi glass to give an orange tint. Faced with no available overlay to purchase for the game, Greek Vectrex fan going under the tag of Geonas (scroll down in this news page to see other entries concerning him), brought his copy of the Sundance Vectrex game one step closer to the arcade cabinet original by creating his own overlay. Again he has used Lee color gels and glossy photo paper to make the overlay. The result as you can see in the photo look pretty good. Side Note: In 2010 there was an interesting story about a Sundance arcade cabinet in an abandoned lodge spotted in a photo on a website dedicated to photographing abandoned places. As soon as it was determined that the photo was in fact of the very rare Sundance and this information posted to the KLOV forums (a well-known forum for arcade collectors), there was a great rush of activity by the forum members all searching and looking for ways to obtain the game. Many were looking at legal ways to ownership by trying to find the owner, and much discussion on the forum followed. But in the end, one member simply helped himself to the cabinet whilst on a family trip, and posted pictures to the forum, much to the anoyance of many of the other forum members. Apparently, he was even contacted by the police. More information can be found on Rotherblog. The story even spawned a homemade cartoon released on YouTube! In February this year I mentioned about Geonas , Vectrex collector and Vectrex fan. He had made an arcade controller and kindly sent me information about it. He has also provided some details on his homemade screen overlays, the first of which I present here. He has made an overlay that he uses when he plays the YASI homebrew game. It is made from Lee color gels and glossy photo paper. The glossy photo paper uses a print out of MAME’s Midway Space Invaders artwork. He cut the inside out and glued in the coloured stripes. The whole product is then finished by laminating it. 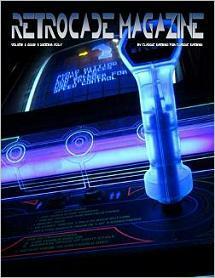 October last year saw the launch of a new digital download magazine called Retrocade Magazine. The feedback from the magazine purchasers indicate that it was a hit. This month see’s the Spring 2012 second edition. At 182 pages its crammed with columns and interviews covering classic gaming content. Of interest to Vectrex fans is a review of Fury’s Sundance and an interview with Jay Smith. The latter is actually an interview conducted by RetroGamingRoundUp.com at the CGE2010 and transcribed to paper by yours truly. This interview is in two parts and the Spring edition of Retrocade Magazine covers mostly the development of the Microvision handheld system and the summer edition will cover the development of the Vectrex. Sunday 26th February - Vectrex high scores - Keep them coming! Thanks to RetroGamerVX, K. Williams, DarrlyB, Eklipse, A Rodriguez, and hoffMan1971 for their highscores achieved these last six weeks. HoffMan1971 has achieved a massive 754,107 score on the Euro version of Mine Storm! Keep those scores coming in! Vectrex collectors are a creative lot. I recently received details from Greek Vectrex owner George Anastasiades also known as Geonas about his unique creations for the Vectrex. He’s provided me with pictures and details for quite a few creations so I’ll spread them over multiple news entries over the weeks. First we begin with George’s homemade arcade joystick controller. It is digital and based on Madtronix's PCB schematics which can be found here. The case is of wooden construction, covered with a thick layer of black - wooden textured - vinyl sticker. On top are placed Vetrex logos which are the black vinyl stickers that are often sold on Ebay. The controller has the joystick positioned to the right and the numbering of buttons ascends from right to left. Some might say this is an unusual configuration as this is the opposite to the official joystick controller. However, this was purposely done so because apparently this is the layout that arcade players are more used to in Greece. This controller takes the Vectrex a step closer to being a real arcade machine. Vectrex Museum.com has developed a Vectrex Locator web-app for the iPhone, iPad and other mobile phones. The web-app is for searching and listing Vectrex collectibles at the most active eBay markets, namely USA, Germany and UK. There is also a built in currency convertor. The fact that the app can run on the phone means that the Vectrex collector can always easily see at anytime what is selling on eBay specifically for the Vectrex. The web-app resides on server and is accessed via the Internet and means that the same application can be used by most mobile devices that can surf the Web (regardless of the brand of phone). Easter egg: There’s a hidden Vectrex Demo video inside VecApp. The first person to find the trigger to start the video wins a Vectrex game module! Confirmation of being the first must be done via the contact web form in VecApp. Chuck Van Pelt of RecycledGamer.com has been making and selling modded game controllers and light pens for the Vectrex for a while now. But this was done on an ad hoc basis and often batch runs would run out accompanied by a silence whilst he beavered away on making a new batch. Well now he has opened an online store and his wares are available to all. These are not pre-sales: If an item is available for sale in the store then it is in stock and will ship right away. Currently he’s got a range of different modded game controllers forsale including SNES D-pads, SEGA Genesis pads and several types of arcade stick. Sunday 8th January 2012 - Vectrex baseball caps: First Vectrex related product of the year! Vectrex fan KosmikNeil has launched the Limited Edition Vectrex Gaming Baseball cap. He sold a few at the end of 2011, and I got one also, but the official release is this year. KosmikNeil is producing a limited edition run of 50 such caps which will be shipped out in the first week of March and he is taking pre orders now. First impressions of the cap is that it is of nice quality. These aren’t your cheap caps with one printed logo at the front. These are high quality fully embroidered caps with Vectrex coloured emblems on both left and right, and front and back sides of the cap. All Mine Storm players will approve, as the mine laying ship and mines are accurately represented in the graphics embroidered on the cap. I could easily imagine that a cap such as this could have been available from the short lived Milton Bradley official Vectrex Owners club in the 80’s. The cap itself includes four vent holes (two on each side) and a strap with Velcro at the rear which is adjustable for the cranially endowed. Monday 2nd Jan - Vectrex Star Castle clocked!!! Today I got an email from Rob Maerz (of Retrocademagazine.com) to say he had achieved a score of 1,005,310 on Star Castle for the Vectrex. He did it with live streaming yesterday, but videos of the stream can be found here. He played the game for around 6.5 hours! The game doesn’t have a pause, so how did he achieve this? His technique was to build up enough ships in reserve so that they could be killed off while he went for a drink, eat etc. I’ve added his entry to the Vectrex high scores page. As he clocked the game, i.e. the score resets after 99,9999 photos aren’t enough, so his entry links directly to the streamed video. Congrats to Rob on this achievement. 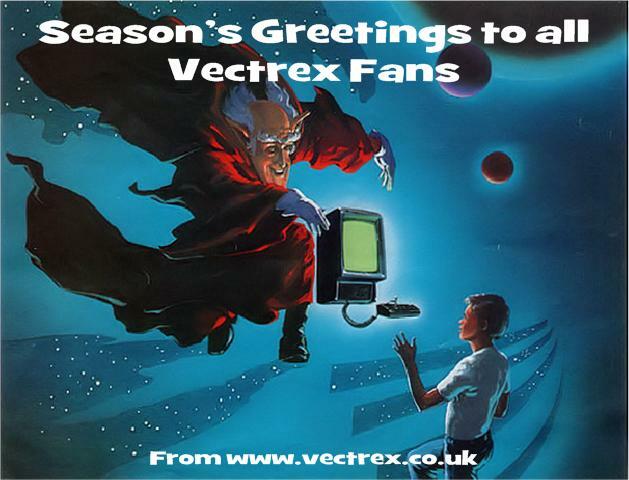 Sunday 1st January - Happy New Year to all Vectrex fans !!! I am pleased that people are accessing the website (and people are reading it). I thank all of those who have given me nice comments about the website and overlays last year. 2011 was a good year for Vectrex fans in that quite a number of releases became available to purchase: Debris LE, Shifted, War of the worlds, Zantis, Sundance and the long awaited Vector Pilot! Although some years in the making Vector Pilot was definitely worth the wait and can be considered to be the best ever Vectrex game to date. From my perspective, 2011 was the year where together with Peteski I managed to finalise the Mine Storm and Pole Position overlays and release them to the Vectrex public. This year I intend to restart my Vectrex programming and finish my first game. I've been working quietly on some other projects plus I've got some new applications and ideas in mind which hopefully will mature enough so I can announce this year. The Vectrex platform continues to survive, and already Vectrex homebrewers have announced their plans for 2012. What am I particularly looking forward to playing in 2012? Its got to be Fury's Warrior game! It promises to be even better than the original 1979 arcade game.